The Destruction Drive is pretty much unbeatable at its price point. Varied tone options. Good value. 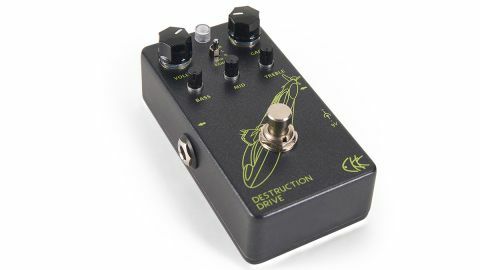 Billed as an "aggressive high-gain distortion", the Destruction Drive features an active three-band EQ - bass, mid and treble - and a three-position midrange switch. The gain range runs from old school AC/DC-esque crunch to the kind of beastly modern filth that welds eyeballs to the back of your skull. The tone controls are a standout feature, with bags of variation - just like you'd find on a great amplifier, in fact. The midrange switch allows you to dial in a sweet spot, the high position being perfect for punching your solos out of a dense mix. If heavy drop-tuned riffage is your thing, you'll love this pedal.